Hello and thanks for stopping by this is my inspiration card for the new challenge at Crafting for all Seasons with the theme All Dressed Up. 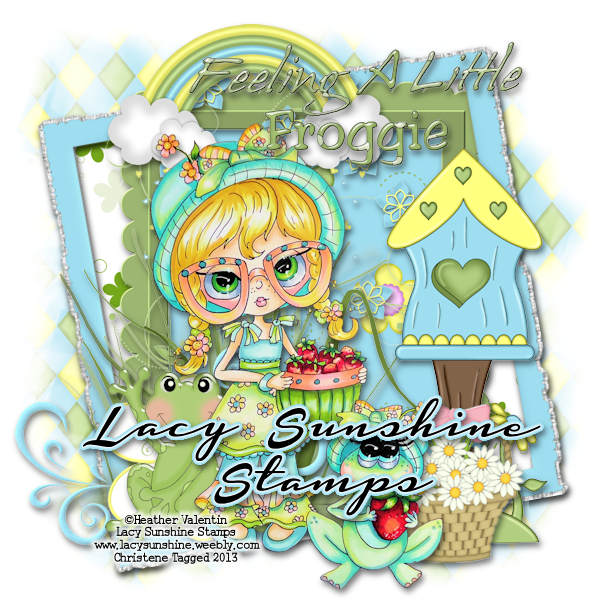 We have a wonderful sponsor for this challenge All Dressed Up Stamps where you'll find a wonderful assortment of fabulous images. For this card I'm using Springtime. I thought she has just the sweetest little face and is all dressed up for her garden and a fun image to color. I colored her with a combination of Copic markers and colored pencils, added some flower soft for the grass. All Dressed Up Stamps also have a Facebook group where they have challenges and you can share your creations. I hope you'll come by and share your creations with us as I enjoy visiting your blogs gathering inspiration along the way. Hello and thank you for stopping by today. This is an image from Julia Spiri's online store from her Winter Collection named The Winter Elf. There is also the Julia Spiri Facebook group where there is a challenge going on as well as Julia's challenge blog. She was a fun little one to color and embellish, I added some Flock for fur on her cape, sandy colored fine Flower Soft for the ground and white Flower Soft for the snow, brown glitter for the logs, clear for the fire then colored over it with Copics. The Graduating paper is from The Ombre Boutique on Etsy, flowers are from a Martha Stewart punch. 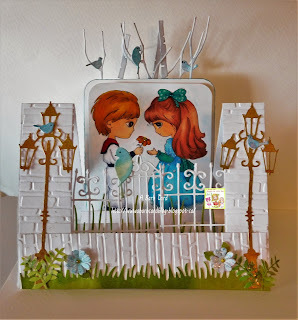 Hello and good day a new challenge begins today at the Lacy Sunshine Challenge Blog with the theme being Once Upon a Dream (Fairy Tales). I thought Floralia would be a wonderful image to use for this challenge, she has such a pretty face, kind of dream like. You can find her and so many more fabulous images plus more from the Lacy Sunshine online store. I hope you'll come and share you creations with us as I enjoy visiting your blogs and gaining inspiration along the way. Right till Oct 30 there is a Halloween challenge taking place, come check it out, you just may want to come join in that one as well. Colored with Copics and touched up with colored pencils. This is Iced Bleeding Heart of the Flower Pot Pretties from the Lacy Sunshine online store. Colored with Copics, Flower Soft for snow, Flocking for "fur" snowflakes are from a Martha Stewart punch glued on acetate. 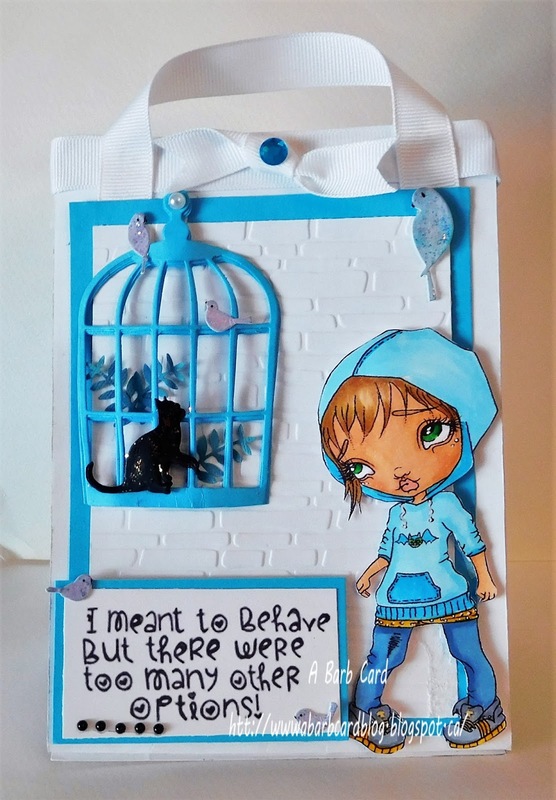 This is one I did with Moon Flower from the Lacy Sunshine online store. Colored with Copics, the paper is called Winter sparkle with matching flourishes and snowflakes, I forget where I bought it but it was an online store, flocking used for fur, embossed with snoflakes folder. Good morning Crafting For All Seasons is looking for 2 new designers to join our friendly team. Do you love to create, can you make one project every fortnight. Then I could be looking for you!! Crafting For All Seasons runs fortnightly on a Wednesday. As part of the team you would be required to. If you would like to join the design team, please email me Erin - erinwithattitude@gmail.com with a little bit about yourself, any Design Teams you have been on before, 3 of your favourite projects. I look forward to hearing from you... Good luck everyone. 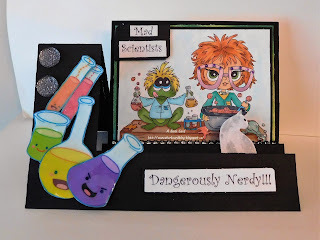 Hello and thanks for stopping by, this is my inspiration for the new challenge at Julia Spiri's challenge blog with the theme being: Dies and or Punches. I'm using Boy and Girl Love from Julia Spiri's Etsy store. She has an amazing assortment of fabulous images and new ones being created by Julia every 2 weeks. If you haven't been to her Etsy store you are missing out from seeing her wonderful works of art. I hope you will come and join us in the challenge as I get lots of inspiration from visiting your blogs. There is also the Julia Spiri's Facebook group so come on over and check it out. I've used various dies, gate, grass, lamp posts and birds, the flowers and leaves are from punches. 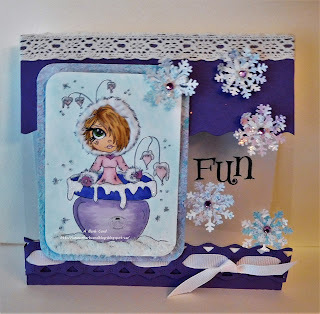 Hello and thanks for stopping by this is my inspiration card for the new challenge at Crafting for all Seasons with the theme Bags and Boxes. 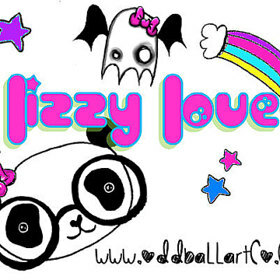 Oddball Art Company, I'm using Carmen image 113 and 113b By Lizzy Love. 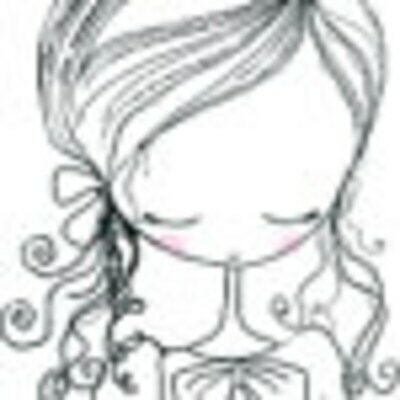 You'll find some fabulous images and so much more at her online shop. I've made a gift box/bag wasn't quite sure which it is but it most definitely will hold a gift. I hope you'll come join in the challenge as I enjoy visiting your blogs and you may become the winner of some fabulous images. 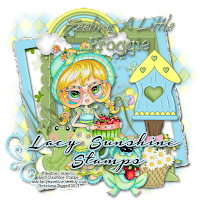 Hello and thanks for stopping by, This is my DT inspiration for the new challenge at the Lacy Sunshine challenge blog with the theme Monster Mash. I'm using Eleanor and Pickles Mad Scientists from the Lacy Sunshine online store. If you visit the store you'll find an amazing assortment of characters (images), Shimmer Sprays, Glitter and so much more. I hope you'll come by and join in the challenge as I enjoy visiting your blogs and finding inspiration along the way. Colored with Copic markers, added Golssy Accents, a lot of gems, the cat is a die cut. This is my DT inspiration card for the new challenge at Julia Spiri's challenge, the theme is: Add Some Bling. I'm using Girl with Hair Wrap, she is so adorable and just one of my favorite images from Julia's Etsy store. There are so many charming images to choose from and new ones being created by Julia every 2 weeks. I hope you will come and join us in the challenge, I get inspiration from visiting your blogs. There is also the Julia Spiri Facebook group where there are challenges and inspiration as well. As You Like It: Sweet or Savoury - SWEET, she has the sweetest little face.